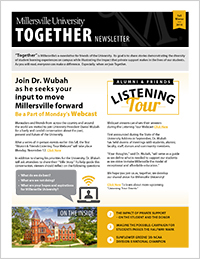 “Together” is Millersville’s e-newsletter for friends of the University. Its goal is to share stories demonstrating the diversity of student learning experiences on campus while illustrating the impact that private support makes in the lives of our students. As you will read, everyone can make a difference. Especially, when we join Together. Marauder Spotlight: Sunflower Greene, NCAA Division II National Champion. the Scholarship Story of a Marauder-Student Athlete.